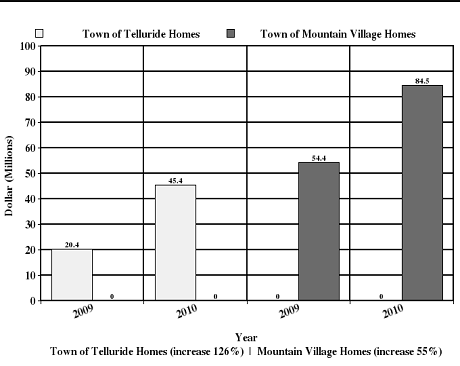 Year-end gross dollar sales in the Telluride Region during 2010 performed 20% above 2009. Sales of $317.6M paced at 92.5% of 2008 which was the partial year of sales production not negatively influenced by the current recession. Numbers of transactions increased 18% and the average price per incident remained stable indicating a stabilizing in value across all market categories. According to statistics compiled by Telluride Consulting, a total of 103 sales transpired in the Town of Telluride representing total gross dollars of $107.2M. A total of 136 sales occurred in the Town of Mountain Village with gross dollars sales of $148.6M. The remainder of San Miguel County experienced 88 sales totaling $61.9M. The brightest segments of the market occurred with a 67% increase in gross dollar sales of Town of Telluride condominiums, a 55% increase in Mountain Village homes and a 126% increase in the Town of Telluride homes. There are 15 pending transactions above $2,000,000, and, when coupled with those already closed above that dollar amount YTD, a total of 60 sales/contracts in 2010 is a very healthy increase over only 13 such sales in 2009. This data seems to indicate a strong renewed interest in investment in the Telluride lifestyle with its limited, high quality inventory. As mentioned in prior market updates, the catalyst for stronger sales has been a willingness by some sellers to accept price levels 20% – 30% below the market highs of 2007. Those sellers are not necessarily in “must sell” situations, but are often times seeking liquidity for alternative investments. Investors are gravitating to discounted “Grade A” properties, and seem to be avoiding the limited number of problematic foreclosure and short sale scenarios in the region. With the gross dollar sales increasing, it is likely that a “bottom” has been reached and sellers will over time resist these deeper discounts and the market will respond with gentle appreciation. Those sellers who have held firm with price structure must remain patient, but oddly have contributed to “setting the bottom” and will influence the rise in future values. Premium properties at significant higher pricing will likely lead the market into a slow, but steady appreciation cycle. With 14 homes and condominiums transacted YTD at an average price of $5,250,000 and with an average PSF of $859, this cycle is likely in motion, given that these sales represent nearly 23% of total sales volume. We look forward to seeing you in Telluride.